The secret behind leaving your yard looking better than before we came is our commitment to having turf friendly equipment. 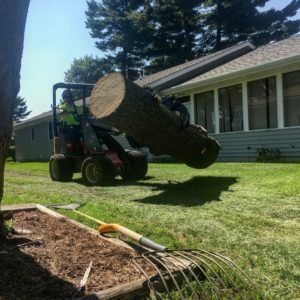 Unless hazardous, all our trees are professionally climbed by an ISA Certified Arborist®. The material is removed from the yard by our small mini articulating loader, which has large turf tires to disperse the weight. If preferred, we can control each piece to the ground using ropes. This method allows us to gently place each piece on the ground and place the branch in the preferred direction. Give us a call to see what we can do for you!